Union Bay Always Lapping at the Heels of Kensington Island Properties aka 34083 Yukon Inc. – Is Another Lousy Deal Being Struck Thanks to the Pro KIP Union Bay Improvement District Trustees? This is from 2015 but was updated March 1, 2017 and is available at the CVRD website. Does anyone really believe KIP is going to build a sewage treatment system? KIP hasn’t provided any plans for water and sewage in the last 20 years. KIP must have both water and sewage plans in place before subdivision. Can’t have one without the other. Where is the discharge going to go? There isn’t going to be any forward movement with this development – just more empty promises. Like McMahon said, they don’t have millions to spend. 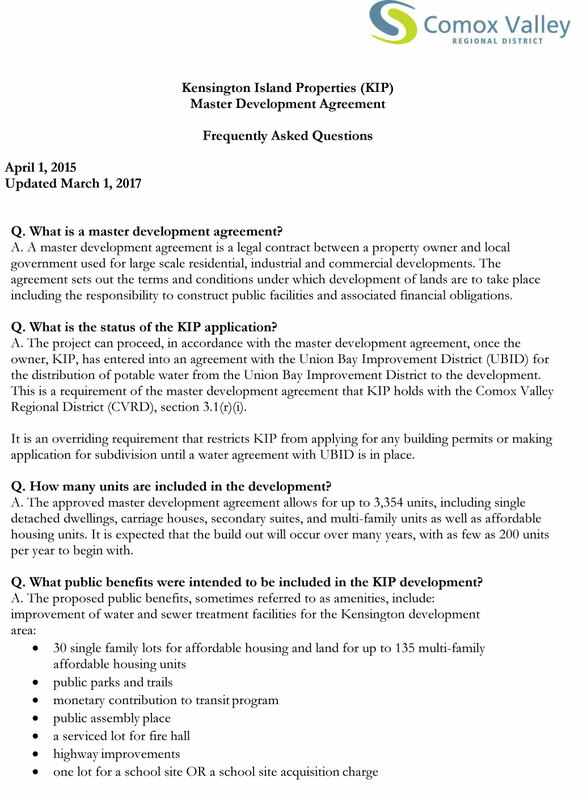 KIP’s master development agreement requires it to build a wastewater treatment facility that could be expanded to include and serve residents in Union Bay and Royston area. The owner (KIP) is responsible for constructing the water infrastructure for the water service. 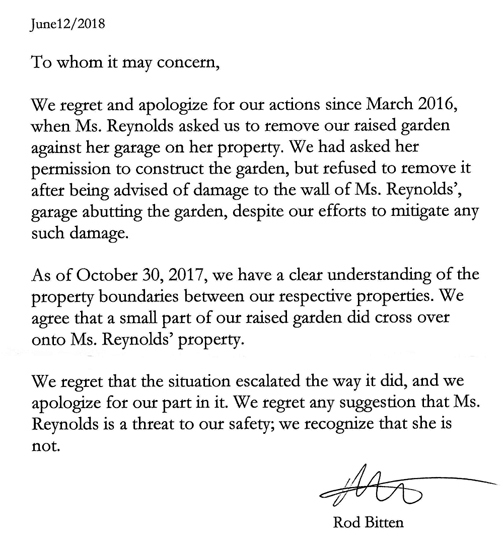 It is an overriding requirement that restricts KIP from applying for any building permit or making application for subdivision until a water agreement with UBID is in place. 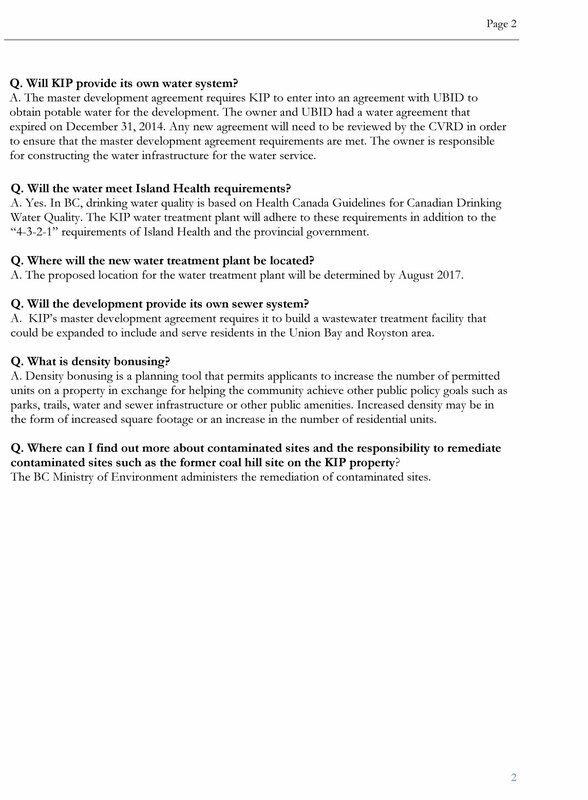 Sufficient water will also be available to existing residents should they wish to be included. 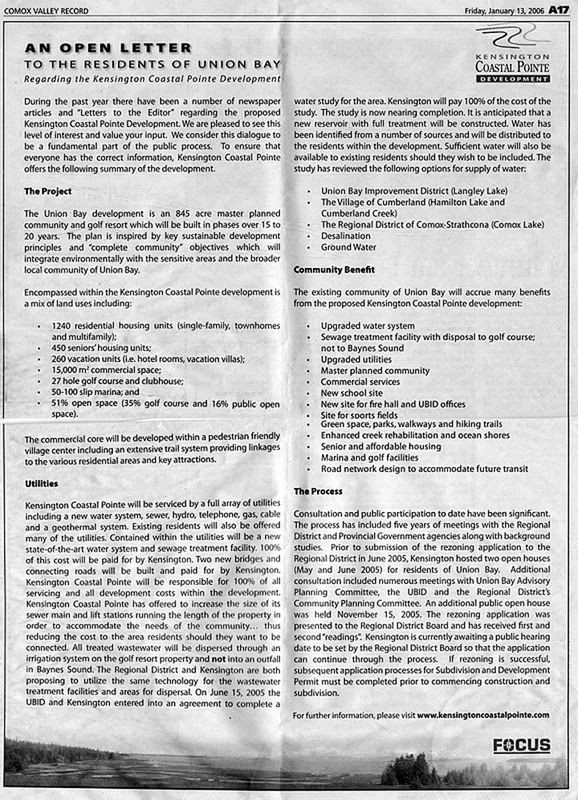 Previous Post Kensington Island Properties aka 34083 Yukon Inc. Deadline Approaching – “Because we’re dealing with government timelines don’t matter,” said McMahon.